Why pay extra for an Architect? Most people question whether or not commissioning an architect is really that important and rarely understand the actual costs of the architectural services. From the perspective of an architect the design outcome will always be greater than that of a project or catalogue home for two main reason. Firstly a licenced Architect in Australia must have a 5 year university degree and have practiced architecture for a minimum of two years before qualifying as a licensed designer. This system of accreditation ensures the architect has the education and knowledge to make informed and sophisticated design decisions. Secondly an Architect’s office will spend hundreds of hours designing and drawing the house whilst a project builder can only afford several hours modifying already pre drawn designs. The question should therefore be, would you want a run of the mill cookie cut house or would you want a high quality, functional and unique home. Apart from first home buyers trying to break into the property market, the majority of Australians want their homes to be something special and should therefore chose an architectural designed home. The misconception that Architects are simply for the rich could not be any further from the truth in modern Australia. In fact an architect will usually be able to produce a home of the same price but considerably greater quality. In some instances it may be even cheaper to go with an architect due to their ability to innovate during design and most importantly secure a fair and honest builder. The diagram above shows two different house designs. The one on the left was designed, built and sold by a Project builder while the house on the right was designed by a licenced architect and constructed by a licenced builder sourced through a tender selection (tender selection is where multiple builders quote for the same project to ensure the price is fair and accurate). 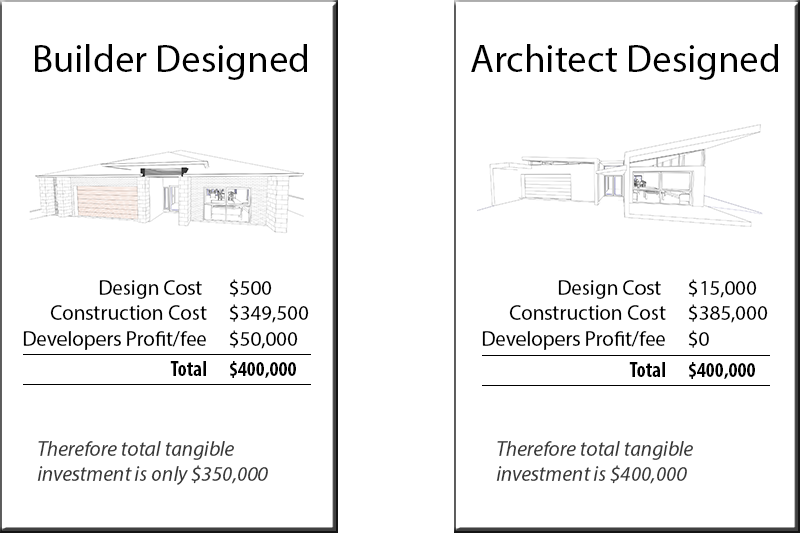 Both homes cost $400,000 in total, yet the home designed by the Architect has $50,000 more invested in its design and construction than the project home. The answer to the question is therefore quite simple. If you are wanting to construct a new home then it will always be more appropriate to commission an architect.